Make a donation to support Duchess Sanctuary! Your donation will be used to care for the almost 200 formerly abused, abandoned, neglected and homeless horses that call Duchess Sanctuary home. You will also be supporting other vital programs of The Fund for Animals. Mares rescued from the pregnant mare urine—or PMU—industry and their offspring make up the majority of the herd at the sanctuary. Other residents include orphaned mustangs, as well as horses rescued from auctions and feedlots. 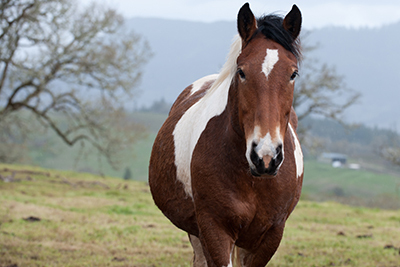 Duchess Sanctuary is committed to providing the highest standards of equine care and basic loving kindness that these horses—and any future residents—deserve. Want to do a little more? Consider buying us something from our Amazon Wishlist! Your donation makes everything we do possible. In gratitude, we'll email you regular updates, breaking news and adorable animal stories detailing the many ways your support makes a difference. The Fund for Animals was founded in 1967 by prominent author and animal advocate Cleveland Amory. The Fund for Animals has spearheaded some of the most significant events in the history of the animal protection movement by employing hard-hitting advocacy campaigns and operating world-famous animal care facilities like the Cleveland Amory Black Beauty Ranch. The Fund for Animals historic victories have saved thousands of animals from cruelty and suffering.